There’s a reason why most tax & accounting professionals think email marketing doesn’t work: They don’t do it right. Shoot, I don’t blame them! After all, those tax tips which come with your commoditized website are handy, and may as well send out that monthly newsletter, right? After all, it’s “free” — part of the service. But if you do that, you’re leaving future clients, new services sold, more referrals … and lots (LOTS) of revenue sitting on the table. I spend my mornings, as you probably do, cranking through my inbox and churning out the marketing junk which has little relevance to me, or my business. Sound familiar? However, if you pay attention to those small firms and businesses which are skyrocketing their sales via EMAIL ALONE, you’ll see that they take a different approach. Their emails get read, get opened — and get acted upon. Don’t you follow the herd — build YOUR herd. 1) Fancy headers make your emails look more “professional”. 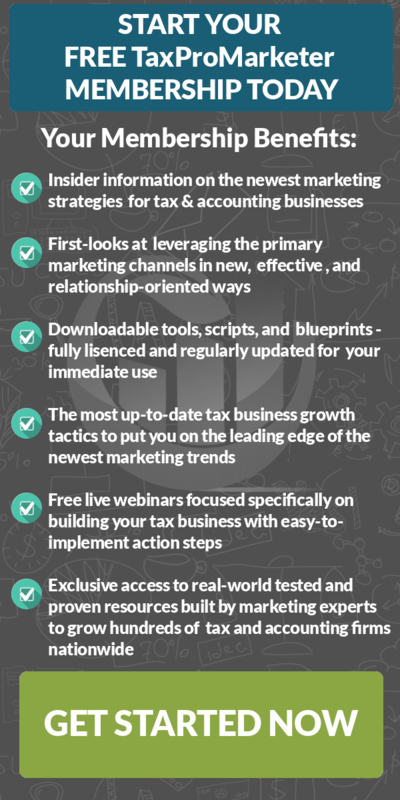 2) “Professional” tax accountants and their partners must maintain a “big business” feel with their marketing communication. Big mistake. A) You’re not Best Buy or AccountingWeb … and by aping these entities, you’re falling for the old canard that “building a brand” is a worthwhile goal for the small firm. B) Email is inherently relational — and when you abuse your contacts’ inbox with stuffy technicalese or commoditized articles, you’re actually demonstrating cavalier disregard for your most important asset: your list. But when you use email RIGHT, you’re actually building deeper relationships with your clients and prospects, and demonstrating that you can be trusted with their time … and with their sensitive financial issues. So don’t blow your greatest asset (your client list) … because it’s the one thing which you CAN “bank” on during this economy. Nate, we are swamped thanks to your email program tools. I have received the most amount of referrals (from good clients). I have RAISED my fees and charging for the value we provide. Thanks! Thanks! Thanks!